The Augusta Cutting Horse Futurity, held Jan. 17-24 in Augusta, Georgia, finished with a bang on Saturday night. 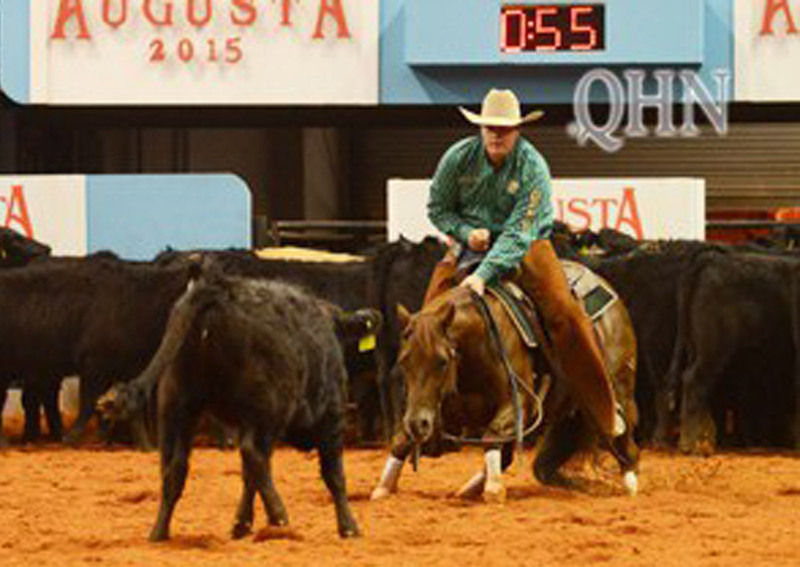 In a tough class of 14 Open-caliber horses, Austin Shepard rode four finalists. The 222 Shepard marked aboard Paradox Cat from the ninth draw earned the duo the 4-Year-Old Futurity Open Championship by a 5.5-point margin. Paradox Cat (High Brow Cat x Thimblerey x Dual Rey), bred by M.J. Christensen, DVM, of Waterloo, Nebraska, proved he had the stuff Open champions are made of during the finals. The three horses that drew before him had lost cows, so the pressure was on for Shepard and the stallion to perform. Blakley Colgrove, of Boligee, Alabama, owns the stallion and piloted him to the 2014 National Cutting Horse Association (NCHA) Futurity Amateur Championship in December. Prior to showing in Augusta, Paradox Cat boasted nearly $10,000 in earnings. That total more than doubled at this event, thanks to his $12,000 4-Year-Old Open paycheck. Shepard’s lifetime record is approaching the $6 million milestone. Shepard, of Summerdale, Alabama, also finished second riding One Catty Cupid (One Time Pepto x ARC Catty Dual x Dual Pep), owned by Joel Colgrove Sr., also of Boligee. The duo’s 216.5 was worth a $10,000 payday, bringing the Arcese Quarter Horses-bred mare’s Equi-Stat record to nearly $25,000.